The Community of S. Peter was founded in 1861 in the parish of Holy Trinity, Brompton by a wealthy layman and his wife, also daughter of a clergyman, Benjamin and Rosamira Lancaster. It started by providing a small convalescent home. 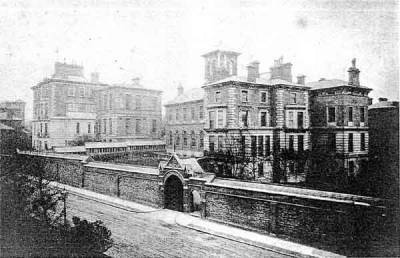 As the community grew the Brompton house became too congested and Mr and Mrs Lancaster bought a house in Mortimer Place, Kilburn, which became S. Peter's Home, then in S. Mary's parish. As the new low church Vicar gave the Community no encouragement and banned the celebration of the Eucharist in their chapel they attended celebrations at local churches such as S. Mark, Hamilton Terrace and S. Mary Magdalene, Paddington. In 1871 when the temporary church of S. Augustine's opened, they had a spiritual centre within easy reach and Fr Kirkpatrick gave them all the help that they needed. 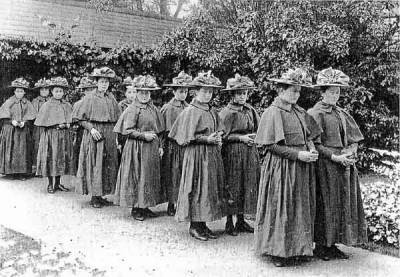 Like the Sisters of the Church, the Community of S. Peter opened new houses in poorer parts of London and in 1883 S. Peter's Convent in Woking, Surrey in spacious grounds with a fine chapel designed by Pearson. On S. Peter's Day 1944, the mother house in Kilburn was caught by the blast from a flying-bomb whilst the Community was at Mass in a semi-basement linen room which was used regularly for worship during bombing periods. Many of the houses around were demolished and the convent suffered irreparable damage. But no one was seriously hurt except the celebrant who was hit with a flying candlestick and cut about the face and head and had a broken nose and the very black eye. A later account claimed that the chalice containing the consecrated Sacrament had been found upright and unspilt when the room was cleared. 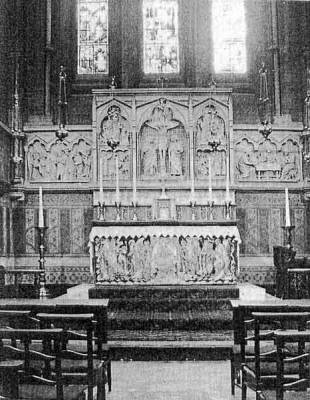 Fr Atkinson, who was then Vicar, came to rescue the Blessed Sacrament and move it to a safer place, the chapel having had the east window blown out. But he first conducted Devotions and the Sisters walked in Procession singing a hymn. So ended S. Peter's Day and work of the Sisters in Kilburn. The Woking Convent then became the mother-house.